The Freisinger Chamber Orchestra’s 11th annual concert retained its still young tradition of mingling the multifarious in celebrating Mozart, Beethoven, Donizetti, Tubin and Bernstein at Boston’s Old South Church Saturday afternoon. With soprano Hailey Fuqua, tenor Ethan Bremner, and pianist Bianca Oglice, conductor and pianist Peter Freisinger wholeheartedly illuminated a late summer afternoon of collectables. His greetings pinpointed to “enjoy” and “pleasant.” The Venetian Gothic Revival of Old South Church could even transport, its quatrefoils and low-key symmetries fulfilling the eye as much as the soul. A quite good crowd furnished evidence of how this September custom has become popular. Nothing on Freisinger’s 2018 program would even hint at anything but the pleasurable and the likable. Most of the orchestral players were in their early careers if not still earning degrees at local universities or conservatories. That, in and of itself, deserves kudos. What an opportunity this was. And I overheard that only three rehearsals had prepared these players. We also learned from the capacious handout that these players hail from some ten different countries and ten different states of the Union. Very probably new to many is the music of the Estonian composer Eduard Tubin, whose Estonian Dance Suite opened the show. Concertmaster Arie Yaacobi’s concert “fiddling” in Crossed Sticks Dance spoke with just the right accent. In A Long Anglaise, woodwinds came together creating moving verdant images. A mysterious passage in Dance from Setu with muted brass might very well have been one of the most memorable orchestral moments. The wide arches formed by conductor Freisinger’s arms said much about achieving synchronicity as much as the interpretive. As to the brass fanfare underpinnings in Mozart’s Symphony No. 36, “Linz,” they were simply too prominent in the early movements. The Menuetto: Allegro needed stronger downbeats to make it dance. The Finale: Presto, though, took off with incisiveness and oftentimes with finesse. After a somewhat too long intermission came vocal duets with Freisinger as pianist. At this point, hearing became listening, as the over-resonant Old South acoustics imposed less and less a hitch. Soprano Hailey Fuqua and tenor Ethan Bremner were contributory in every way. Clear, straight-ahead singing with delectable vibrato, the duo delivered verve to Leonard Bernstein’s “Oh Happy We” from Candide. And from his West Side Story came a heartfelt rendering of “One Hand, One heart.” Freisinger opted for extended piano introductions and transitions that would figure into a theatrical touch. The “Balcony Scene” with mainstay song “Tonight,” though sung with vocal loveliness, got a little saccharine. It might have helped to have had the text, or at least some context for Donizetti’s L’elisir d’amore. As well known to opera buffs as it is, there were probably quite a few who wished to know something about the storyline. This was operatic comedy from the two singers that drew a few chortles and a bunch of raves. 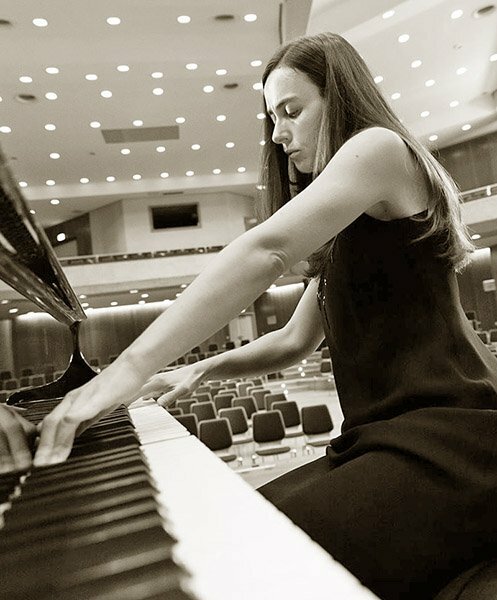 Bianca Oglice appeared as soloist in the Beethoven Piano Concerto No. 1 in C Major, op 15, which burst through with an integrity and gusto to put one on notice. Obviously informed, her iteration of the often played concerto truly took hold. Orchestral transparency finally materialized, but the band’s dialogues with Oglice often drifted out of touch. Nevertheless, brava Bianca! Very fine review, but two comments: Ethan Bremner’s voice is luscious, liquid, worthy of chasing down, wherever. And Bianca Oglice’s performance gave us the sort of surprise we relish, one of the many pluses of musical Boston. Again, one to follow.